The moment the lawsuit started, it was ugly. Sofia Vergara and Nick Loeb have moved well past ugly into uncharted territory in their courtroom battle that addresses views about life itself. As we wrote after the case began, Vergara and Loeb's disagreement teaches an important lessons for anyone considering IVF or other mean of assisted reproductive technology. But there's a greater lesson now. When the courtroom is the backdrop for a relationship of love turned to hate, things can rapidly spiral out of control. Johnny Depp and Amber Heard provided a good example recently. But even they -- despite dramatic accusations of spousal abuse, infidelity, blackmail, and more -- found a way to put their differences aside, reach a settlement, and end the fighting. Vergara and Loeb don't appear to be heading down the same path. Neither is willing to blink about what should happen to the two frozen embryos that they had created while together as a couple. At the time, Vergara and Loeb tried to use In Vitro Fertilization to conceive a child. They split after one failed attempt, before trying for a second time. Two female embryos were left frozen. 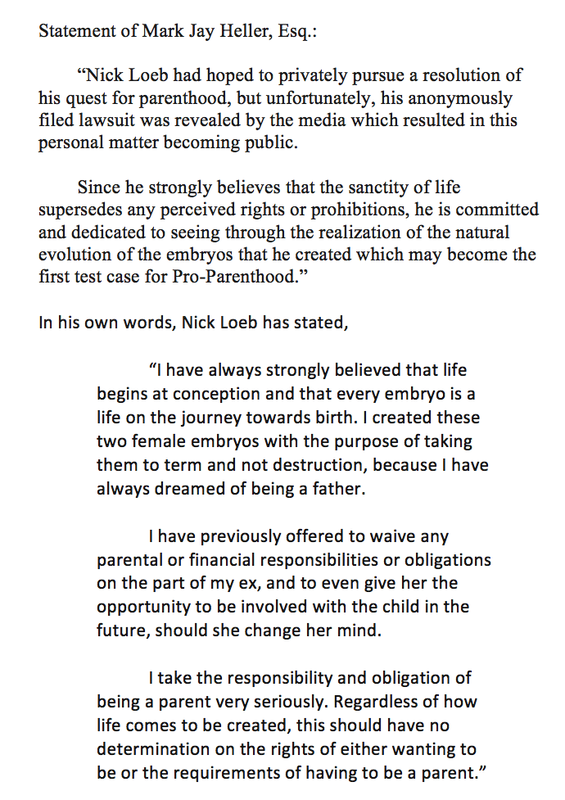 At the start of the IVF process, Sofia Vergara and Nick Loeb both signed a form directive from the medical facility. This form included an agreement with different options for what would happen to the embryos if not implanted. They filled out the form and both signed it, indicating that if either of them died, the embryos would be thawed, which would destroy them. The embryos would only be implanted or otherwise used if both Vergara and Loeb agreed to it. If not, the embryos would remain frozen indefinitely. It began with an anonymous court filing pitting “John Doe” against “Jane Doe.” It didn’t take long for Jane and John to be identified publicly as Modern Family‘s Sofia Vergara and creator of the Onion Crunch, Nick Loeb. Formerly engaged to be married, the ex-couple now is heading to court battling against each other over what could be a drawn-out debate involving the fundamental question: When does life begin? What's at stake? Control over two female frozen embryos, held in a Beverly Hills fertility center. When Sofia Vergara and Nick Loeb were engaged, they decided to use in vitro fertilization and a gestational surrogate to have a baby. Their first efforts failed when two prior embryos did not successfully implant in the woman they chose to carry the baby to term. Vergara and Loeb tried a second time, again leading to the creation of two viable embryos. Before the new embryos could be implanted in a different surrogate, the couple called off their engagement.